New Zealand Spinach (Tetragonia tetragonioides) or tetragon is a leaf vegetable, grown for its edible leaves and can be used as food or an ornamental plant for ground cover. 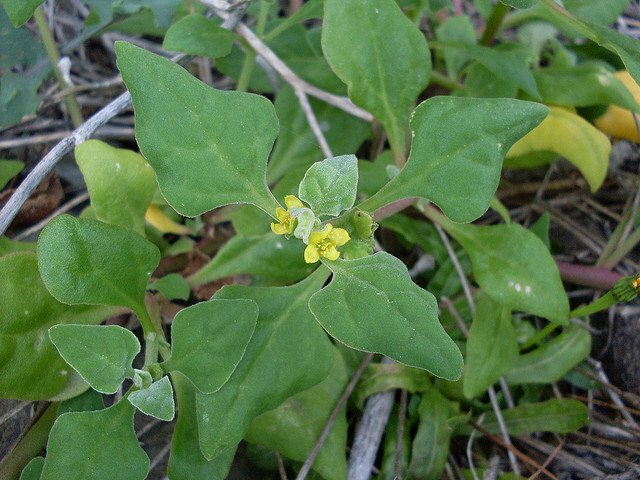 It is native to New Zealand, Australia, Japan, Chile and Argentina where the flavor and texture resemble spinach. Here are 7 health benefits of New Zealand spinach. 1. New Zealand Spinach is a low-calorie food. New Zealand spinach is low in calories, high in fiber, and has zero fat. One hundred of New Zealand spinach contains 12 calories and 1.4 grams of fiber. The daily recommended fiber intake for men and women are 38 grams and 25 grams, respectively. Fiber aids in digestion, prevents constipation, and reduces the risk of heart disease. 2. New Zealand Spinach is great for improving bone health. One hundred grams of New Zealand spinach contains 292 mcg or 278 percent of vitamin K. Vitamin K improves calcium absorption, reduces urinary excretion of calcium, and acts as a modifier of bone matrix proteins. Also, one hundred grams of New Zealand spinach contains 3 percent of your calcium needs. 3. New Zealand Spinach improves eye health. New Zealand Spinach is a rich source of beta-carotene, which benefits eyesight. Beta-carotene can be converted to vitamin A. This can prevent people from suffering from vitamin A deficiency, itching eyes, eye ulcers, and dry eyes. 4. New Zealand Spinach may help in cancer prevention. Beta-carotene has been known to be one of the nutrients that decrease individuals’ risk of developing asthma. New Zealand spinach is loaded with beta-carotene. 5. New Zealand Spinach is great for the hair and skin. Adequate vitamin C intake does not only improve the immune system, can also create and maintain collagen, an essential protein found in hair and skin. Also, New Zealand spinach contains 49 percent of recommended vitamin A per cup. Vitamin A has been known to keep the hair moisturized through increased sebum production. 6. New Zealand Spinach could improve your immune system. One cup of New Zealand spinach contains 28 percent of the recommended vitamin C needs. This can improve an individual’s immune system, metabolism, and hydration. 7. New Zealand Spinach can help improve an individual’s sleep. New Zealand spinach has a high content of magnesium, which is a mineral that is directly linked to improving the quality, duration, and tranquility of sleep. New Zealand spinach also helps regulate the metabolism, to help reduce sleep disorders and the occurrence of insomnia. Beta-carotene, carotenoids, and disease prevention in humans.